Since its inception in February, 1998, The Youth Support Farm Project now has 30 members between the ages of 14 and 18. The land and use of buildings was generously supplied by Kerry and Joan Wentzell and is in Crousetown, 20 minutes from the town of Bridgewater. 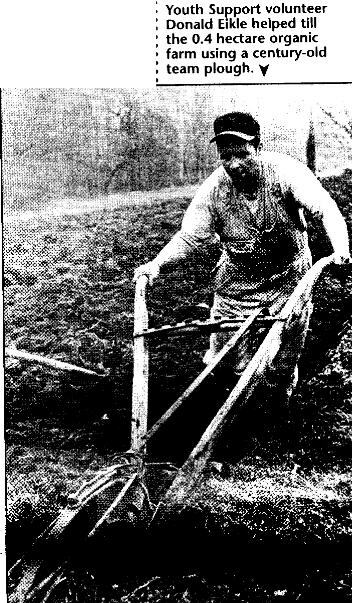 In late February, early March, we started making soil blocks and germinating seeds.In March, we plowed with a team of oxen ground that had never been broken..We pulled out sod and 3 tons of rock (I kept a count!). We dismantled a greenhouse donated to us and moved it from Kejimkujik, one hour away and erected it on our site. (Unfortunately, that first attempt didn't survive a summer wind storm....). Late spring we started transplanting and we had about 40 varieties of vegetables, herbs and flowers. For the 1999 season, we'll be limiting that, learning from last year, people 'round here won't buy what they can't pronounce! We planted .4 hectares last season. Lots to weed! We were all novices and learned lots from our first season. This year we will stagger the crops so it doesn't all need to be picked at once. And we'll make sure there's always LOTS of insect repellant on hand! Spring and early summer's blackflies led into mosquito season! 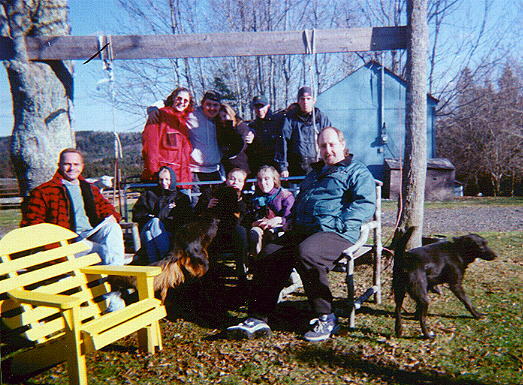 Throughout the summer season we did other things: Everyone had a chance to take turns cooking or barbequeing (....and doing dishes....), we started experimenting with log and twig furniture, which we will pursue again this season and trips to Crescent and Hirtle's Beach. In the fall we turned our hands to preserving, making about a dozen different pickles and jams. We could have done a better job at marketing, but it seemed our time was consumed by pulling weeds, rocks and swatting bugs. A dry spell in August dryed the well up, and a great deal of time was spent on 'bucket brigades' which would take a good part of a day up soaking the garden. That's remedied for this summer: we've obtained a generator and pump. We'd posted the area and installed the conducts for an electric fence, but with so many dogs, cattle and assorted barnyard creatures about, we never had a problem with wildlife. 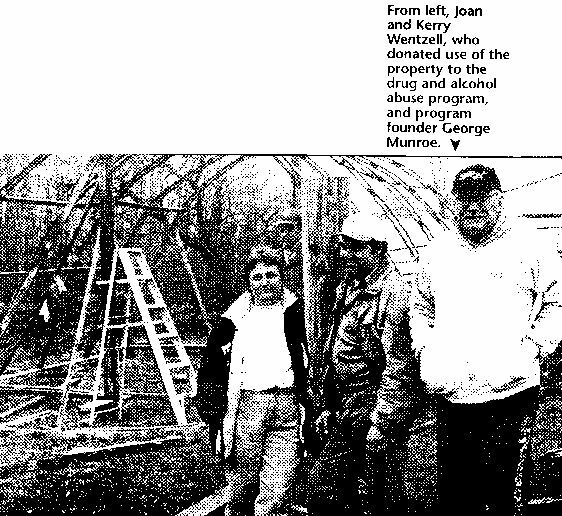 As of this update (14 February,'99) we've erected a new frame for a 40' greenhouse. It's frame is of braced rebar and is well anchored. Let the winds blow! We've also cleared another area to move our mounds for pumpkins and squash. Last years site was two shaded. With the undergrowth cleared, the brush went to make a fence around the pond to keep coyotes away from the geese and ducks. This coming week is March Break in the schools, so it's a work week. Soil blocks and seeding. We've had a tiller donated, so we'll re-plow our earth. We have a better marketing plan for this summer, and will be attending all the local Farmer's Markets. Also, we'll be supplying local Inn's and restaurants with fresh organic produce. Our goal for this season is to earn enough to have a barn raising in the fall. We're looking into the feasibility of a staw bale structure. I have learned as much as the kids, so far. I 've also learned, that with time and patience, you may take a broken child, and help them become a whole adult. We've taken young people some who've been written off by parents, teachers and peers, and by giving them a challenge and responsibility, see them bloom and grow, like the seedlings they've been given responsibility of. We're mighty proud of our kids. 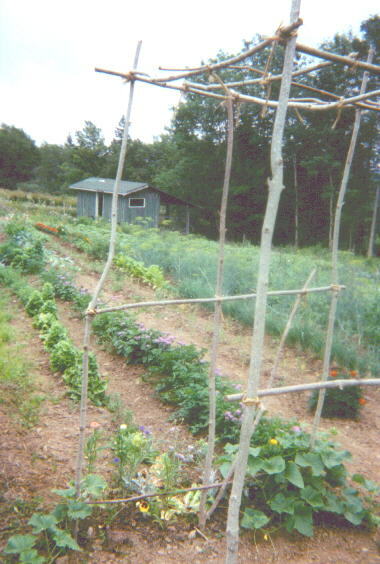 (26 April, 1999): The greenhouse has been completed. Electricity has been installed to work the blowers keeping the plastic inflated (and to power the boom box!) Beds have been dug inside. This is so we can start new vegetables, etc. to transplant into the garden to replace what is taken out later. The first seeds were planted outside last Saturday after the field had been re-tilled with a tiller that was donated. George is working on an irrigation system with a pump to move water from the pond so we won't be caught off guard by a drought like last year! Next: dismantling a cabin and moving it to our property to be used as a mess hall/ meeting place. NS Museum's 'ROSS FARM', New Ross, Lunenburg County, Nova Scotia, circa 1816 These oxen are similar to ones used in Youth Support Farm Project Traditionally, all oxen teams are named "Bright" and "Lion"
Internet Gardening Discussion Groups, Publications, Etc. The WWW Virtual Library for Gardening EVERYTHING to do with gardening!